In AO2, 100% of the observing time available is used for GO observation. The current schedule for the time allocation between Japanese and US PI is given in Table 3.1. The AO will run for a year starting in April 2007. After a year of operation, we know that the actual observing efficiency is a little higher than the 37 ks per day estimated for AO1, but for the purpose of proposal selection, we assume the same (37 ks) good on-source time per day, and 360 days of operations per year. From the total of 13320 ks, we subtract 4% of the available time as observatory time used for satellite maintenance and similar purposes, and 3% for ongoing calibration observations. Finally, 5% is earmarked as Director's Discretionary Time (DDT) for unproposed Target of Opportunity (TOO) proposals (including observations of gamma-ray bursts) and other important observations, granted at the mission director's discretion. Therefore 13320 0.88 = 11722 ks are nominally available to the community via the proposal selection process. The project will oversubscribe this total by 40% including category C targets whose observations are not guaranteed (see §3.4 below). If the actual sum of the observatory, calibration, and director's times is less than 12%, additional C targets will be observed. In this AO, 50% of the total observing time is assigned to Japanese observations and 37.5% goes to US observations. The reminder 12.5% is set aside for Japan-US joint investigations. When the respective national reviews have selected the same target, the two proposals will be merged if both teams indicated their willingness to collaborate on the RPS form, and the observation will be counted against the Japan-US time. If such mergers do not take up 12.5% of total time, the remainder will be divided between separate Japanese and US investigations. An additional 8% of the total observing time from within the "Japanese" allocation, is reserved for proposals submitted to ESA as joint Japan-ESA observations. This means that the total time available to US researchers is 4396 ks, plus 1465 ks of joint time, identical to what it was for AO1. European (ESA) proposals will receive 938 ks of observing time. Proposals from non-US, non-ESA countries will be accepted within the Japanese time up to the ESA portion. Table 3.1: Suzaku percentage (first line) and actual ks (second line) of time allocated to each group of observers The ESA time is in parentheses as it is part of the Japanese allotment. The nationality of the PI's institution determines which agency should receive the proposal. That is, resident researchers at US institutions must submit their proposals to NASA and those at institutions in ESA member countries must submit theirs to ESA (regardless of their actual nationality). While the ISAS/JAXA proposal process is primarily aimed at researchers resident in Japan, proposals from researchers in other (non-US, non-ESA) countries will also be considered. In addition, Co-Is from any country may be part of any proposal. The data rights policy for Suzaku is similar to previous missions. The normal exclusive period for both SWG and GO data is one year, except that all Phase Ia SWG science data will be made available at the end of this AO. DDT data are made public immediately. During AO-2, category A and B targets will be considered complete if 90% (for A targets) or 70% (for B targets) of the proposed time is obtained on the source. During the GO phase, data from calibration and TOOs requested outside the proposal process (see below) will not be considered proprietary. Data taken during spacecraft maneuvers (often called ``slew data'') will be proceeded and made public immediately. Maneuver data is defined as data taken when the source out of the Suzaku FOV, defined as being more than away. Observation time, however, will not begin until the source is stable in the FOV. TOO proposals are allowed for Suzaku through the normal proposal process, although they must be ranked as category A targets (see below) to be accepted. Proposals with TOOs should not be mixed with non-TOO targets. TOO proposals are allowed for short-lived events on known objects whose timing is uncertain. These should only include unpredictable phenomena in a specific target (e.g. SS Cyg in outburst; ``Triggered Observations'' in XMM-Newton parlance), not a generic target (e.g. the next Galactic supernova). The triggering criteria must be explicit and quantifiable, and stated in detail in the proposal text; a brief summary should appear in the Remarks section of the target form. In addition, TOO proposals must provide an estimated probability of a successful trigger during the AO-2 period. It is the PI's responsibility to notify the Suzaku project when the criteria are met. Generic TOOs without a specific target (such as "a nearby supernova") will not be accepted. In the same spirit, the number of targets in TOO proposals should not exceed 5. Gamma-ray bursts or any genuinely unpredictable events may be observed outside the proposal process, as part of the 5% DDT. Data from such observations will not have a proprietary period. The Solar panels on the Suzaku satellite are fixed. This places a restriction on the pointing direction with respect to the satellite-Sun line: the Sun angle constraint is normally 65 - 110 degrees. This means that at any given time of the year, only a swath of the sky 45 degrees wide is accessible for astronomical observations, and thus most celestial sources are available for observations for about 50 days every 6 months. If a specific observing date or a coordinated observation with other missions is required, the proposer must first determine if the observation is possible. This can be done using the ``Viewing'' tool on the Suzaku proposal website (see Appendix C). Note that a constrained observation must be ranked as Category A (see below) to be accepted. It is anticipated that long ( 1 day) observations will be the norm for Suzaku, based on the Suzaku SWG target list. In addition, a large number of short observations is an inefficient use of the satellite because of the unusable time during slews and attitude settling. The pointing is expected to be accurate to 0.3 arcmin and can be reconstructed to better than 0.2 arcmin, except during the initial settling period of up to 10 minutes. Moreover, there is a limit on the number of slews that can be uploaded to Suzaku. For these reasons, a minimum exposure time of 10 ksec has been set for all proposed observations. However, raster observations over a small ( ) area of the sky may be allowed where the individual pointings are at least 3 ksec. For such observations, the total exposure time (which must still be at least 10 ksec) and the number of separate pointings should be entered into the RPS form. Particularly complicated operations may not be feasible; please contact either the ISAS/JAXA Suzaku team or the NASA Suzaku GOF for assistance on difficult or unusual observation plans. There are also orbital constraints upon the orientation of the projection of the XIS CCDs on the sky. Since the Suzaku XIS arrays are square, with calibration sources in different corners, selecting a specific roll angle is rarely significant. However, if a specific roll angle is scientifically advantageous, the proposer must first determine if it is allowed. This can be done using the MAKI tool described in §4.7. Then the required roll range can be entered on the RPS proposal form. For objects close to the ecliptic poles it is possible to arrange for any XIS orientation by scheduling observations at a specific time, but for those located close to the ecliptic, the XIS will project on the sky in a nearly fixed orientation. Note that any roll constraint will make a proposal time critical. Due to their increased overhead, only a fraction of the total available time can be used for constrained observations, and proposers should justify their requirements carefully. During a pointed observation, there will be interruptions due to the location of Suzaku in a low Earth orbit. Normally, a target will be occulted by the Earth for 30 minutes every satellite orbit. In addition, Suzaku will pass through the South Atlantic Anomaly (SAA) during parts of 5 or 6 orbits every day. Due to the harsh radiation environment of the SAA, scientific observation is not possible during SAA passages. There are other variations in the particle background, depending primarily on the cut-off rigidity3.1. The optimal criteria to reduce times of high background while maximizes the science return is still being determined from SWG observations; please check the Suzaku websites (see Appendix C) for the most up-to-date suggestions. After the Suzaku proposal deadline, there will be three independent proposal reviews for the US, Japan, and ESA proposals. Each review will create a target list from the proposed observations, ranking the accepted targets as category A, B, or C. Only category A and B targets are guaranteed to be observed. As stated above, TOOs and constrained observations are only accepted if they are in category A. Category C targets will be observed as time permits, and will not be carried over into the next AO if not observed in this AO. An international merging committee will collate the three target lists and produce a single, unified list. Overlaps between US and Japanese targets will be resolved, either by merging the investigations (if both parties are willing) or by choosing one. In the latter process, the priority given by the national reviews, as well as the lengths of the accepted observations, will be considered. The final target list will be % oversubscribed. Category A targets will have 50% of the available time, category B 40%, and category C 50%. US PIs, or US Co-Is on foreign PI projects, may propose for funding once notified that their target has been accepted. This process is described in ROSES-2006 document; further details of this process will be made available on the NASA Suzaku GOF website listed in Appendix C.
Even though observations are scheduled to acquire roughly the approved exposure time, and ASCA experiences suggest this will usually be achieved with Suzaku, occasional losses of usable observation time are inevitable. As mentioned above, Category A observations will be deemed complete when they have received at least 90% of the approved time. Note that this will be judged based on the good time intervals of the cleaned XIS event files after the standard screening. Dead times (including those due to the use of the burst option) are not taken into account. Also, the standard screening for the HXD is more strict, so the effective exposure for the HXD is often smaller than that of the XIS by 20% or more. Additional observations will be scheduled automatically for non-time-critical targets whose observations are considered incomplete by the project scientist at ISAS. In the case of time-critical observations which are incomplete or unusable, it will be the PI's responsibility to determine the best course of action. Each PI will be assigned a contact scientist, either at ISAS or the NASA Suzaku GOF, who will work with the PI to assure the maximum science return. This will include double-checking coordinates, count rates and finalizing configurations (nominal pointing, XIS modes,...). It is important to note that once an observation has been scheduled, any delay in responding to questions from the contact scientist may result in targets being removed from the schedule. We do not have a mechanism to approve coordinated observations with Suzaku and another observatory through a single proposal. It is the PI's responsibility to secure observing time with other observatories, when simultaneous observations are desirable. Please note that the Suzaku component of such a proposal may be approved contingent on the success of other proposals. Special scheduling request and TOOs will be accommodated on a best effort basis. For simultaneous observations, the mission scheduler at ISAS, in consultation with the contact scientist, will contact the PI in advance for detailed scheduling information, and will often work directly with schedulers of other missions. During AO1 observing period, the Suzaku scheduling team made all efforts to accommodate requests of coordinated/simulatenous observations with other facilities and we expect that it will continue to do so during AO2. Once the observation has been completed, the data will be promptly run through the processing pipeline and put into both the US and Japanese archives, initially in encrypted form. The PI will be sent the decryption key along with instructions on how to download and decrypt the data. The only exception to the one year exclusive period for GO data, concerns the HXD Wide-band All-sky Monitor (WAM) data (see Chapter 7). The WAM is primarily used for anticoincidence shielding in the HXD, but it can also be used as an all-sky monitor, detecting solar flares, gamma-ray bursts, and other bright X-ray sources (e.g. Cyg X-1). All data from the WAM will be monitored by the HXD team, which will alert the GRB community to any detected bursts. In addition, the HXD team will make analysis results from WAM, such as light curves and fluences, available to the public as soon as possible. These may be used to put limits on GRBs or other events triggered by other satellites or observatories. However, the PI will receive the complete WAM data from their observation and will share data rights with the Suzaku team for the normal 1 year proprietary period. This unusual arrangement is due to the time-critical and non-source-specific nature of the WAM data. 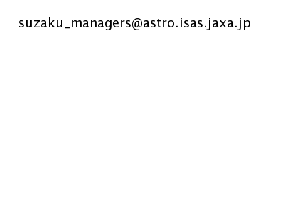 With the exception of the code that converts raw binary telemetry into FITS format files, all Suzaku software is written as FTOOLS and distributed through the Suzaku team at ISAS/JAXA and the NASA/GSFC HEASARC. This includes the tools used in the processing. All calibration files are distributed through the HEASARC caldb (Calibration Database) system. This enable users to apply any calibration updates themselves. The Suzaku team at ISAS and the NASA Suzaku GOF provide additional FTOOLS that may be necessary or desirable in analyzing Suzaku data. Use of other software packages will only be supported at a lower priority level.